a few weeks ago i saw these totally amazing personalized clay eggs on etsy..
only problem is.. i couldn't justify buying them. so i decided to try and make my own. 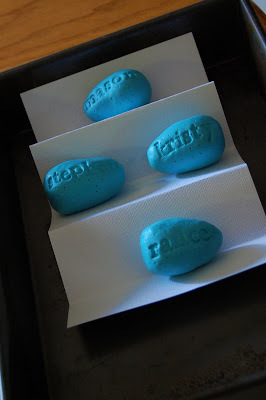 i couldn't find a tutorial for how to specifically make the stamped eggs..
but i found some tutorials on making clay eggs & on stamping clay & worked from there. 1. tear off a piece of aluminum foil & crumple it up into the shape of an egg. squish it really good so you get all the air pockets out. the egg needs to be slightly smaller than what you intend your finish project to be. do this for as many eggs as you intend on making. 2. preheat oven according to your clay's directions. 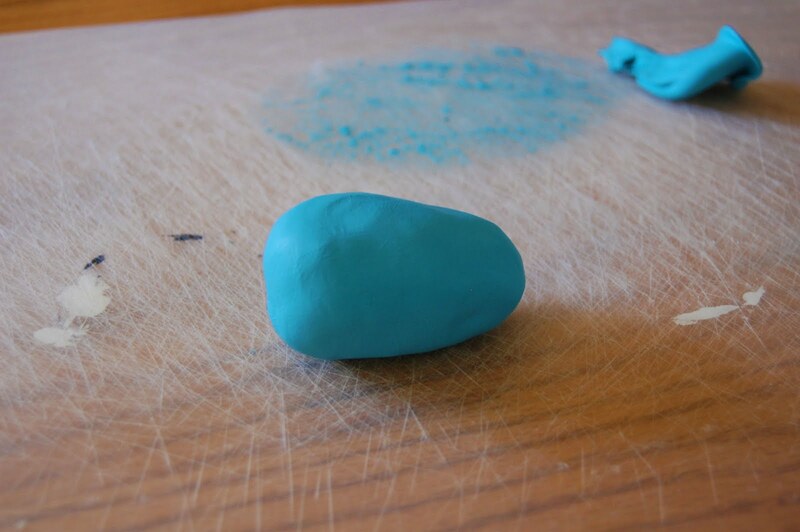 knead your clay approximately 2 minutes. 3. roll out your clay to about 1/4" inch thickness. if you don't have a rolling pin (because i don't) use a smooth sided glass or something similar. 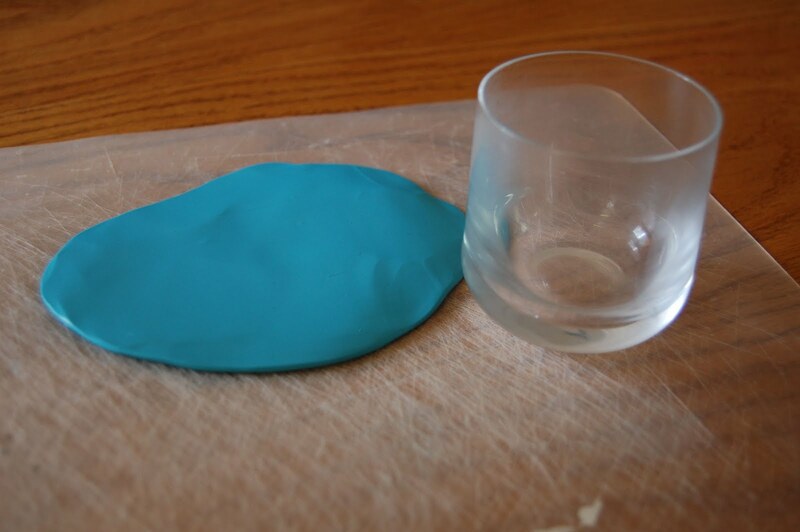 make sure you are working on a surface other than your furniture because the clay can discolor your furniture! 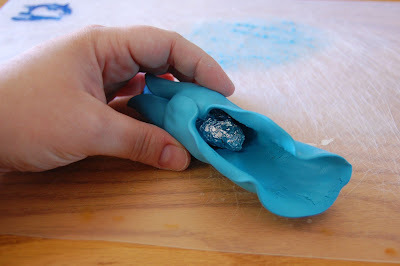 4. once your clay is rolled out, wrap it around your foil egg shape, making sure to keep it tight around the form to prevent pockets of air from forming. 5. pinch off the excess clay & begin working the clay to smooth it out & form it into an egg shape. 6. all of the tutorials i read recommended piercing the clay to allow any trapped air to escape, so that's what i did. i figured it'd be covered up by the speckles so i went for it. 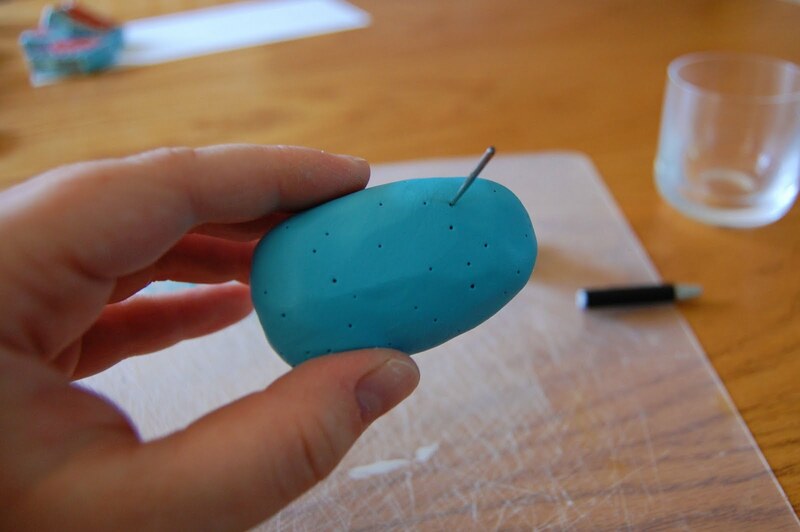 make sure you only poke around the sides & back of the egg, so you have a smooth surface to stamp on. you can go back & pierce more once you've stamped. 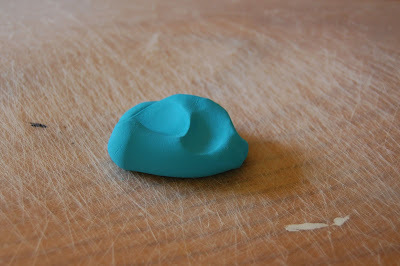 7. using your stamps press down firmly enough to make an impression in the clay, but not so much to change the shape of your egg. if the edges of your stamp make a mark you can smooth back over it with your finger. 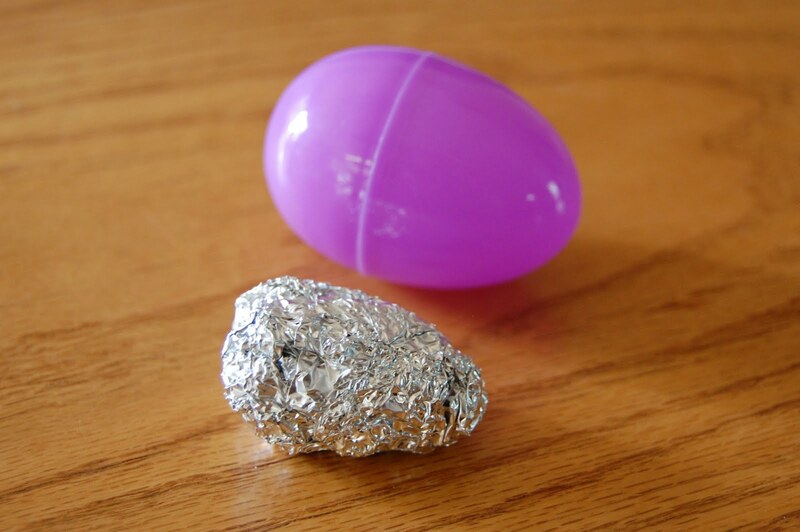 8. once all your eggs are finished, accordian fold your piece of cardstock & place it inside a baking pan, putting the eggs in the folds. according to what i read this keeps the egg from getting a flat spot on the bottom as it bakes. bake your clay according to your package directions. mine stated to bake 15 minutes for each 1/4" inch thick. i baked for 20 just to be safe. 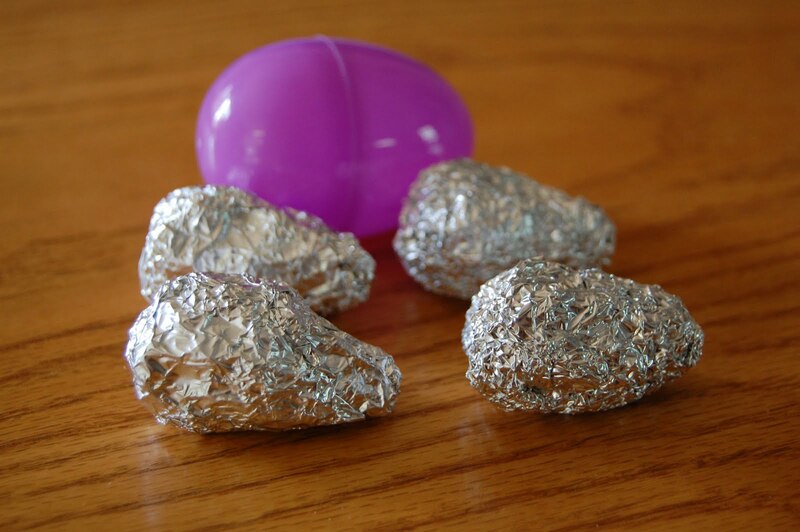 9. once your eggs have cooled it's time to speckle them! i mixed a little burnt umber acrylic paint with a smidge of white paint & a little water to thin it out. dip your toothbrush into the paint & holding it with the bristles away from you pull back on the bristles to flick the paint onto your egg. 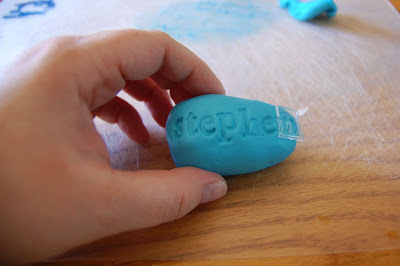 10. using a small paint brush paint the indentions of your letters. you can put your eggs back into the oven for another 5 minutes to set the paint (i did.) or let them air dry for a few hours. i cut up two different colors of cardstock into little strips, crumpled them up & put them in a bowl to complete my nest. 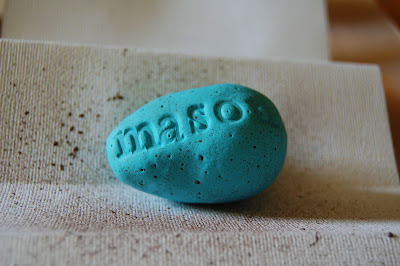 they are rustic & hand-hewn looking..
not nearly as perfect looking as the etsy ones..
Ah! I LOVE them!!! Seriously, I could do this. I'm so glad you made this tutorial. 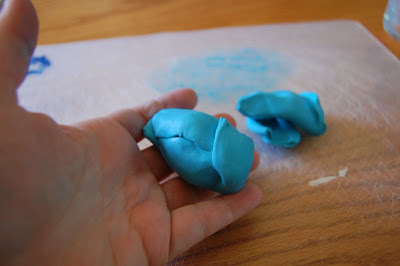 I'm going to try making some because honestly, way to stinken' cute! okay, so they are cool and the directions sooo easy i think i might be able to make them! Oh my gosh! These are so great!! 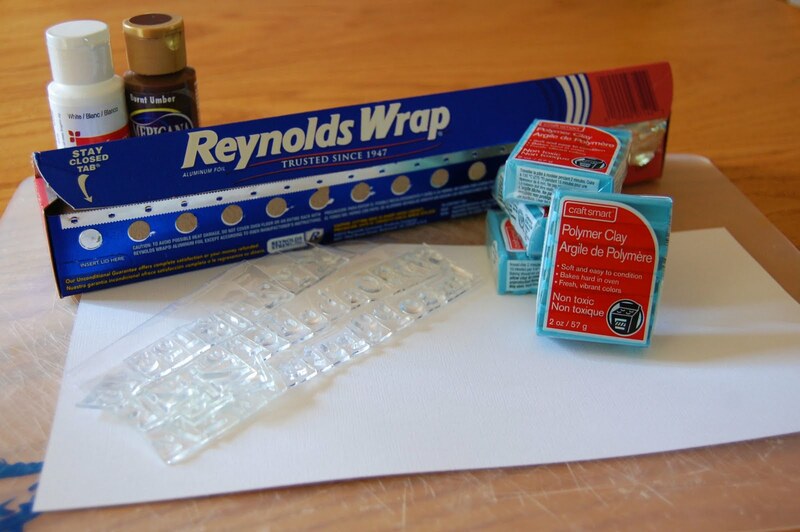 Thanks for a great step-by-step tutorial! Bookmarking this idea for sure! I made some on 4/8/11 that are very similar to yours. YES! 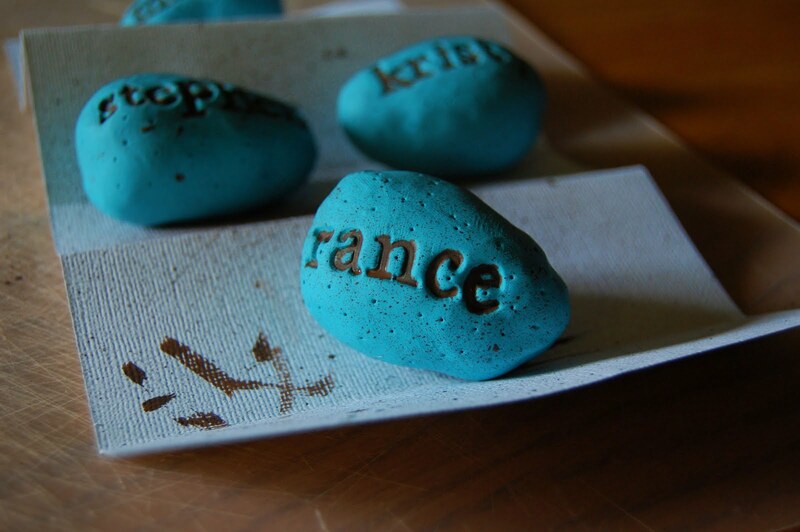 This is exactly the type of craft project my boys can do during screen-free week. Please link on my blog so we do this craft, thanks! 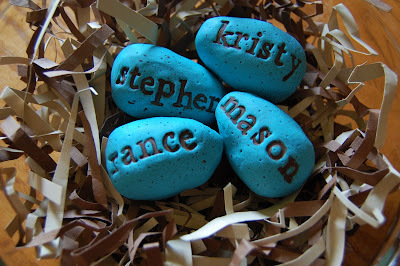 THis is so helpful, I wanted to make my own family stones and same as you I just couldn't justify buying them off etsy. Thank you for the tutorial. This is so cute. I am going to have to try these!